Bourbon is America’s native spirit. 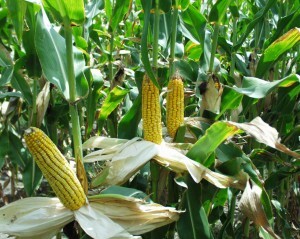 It is a type of american whiskey made mainly from corn. Its name derives from the historical association with an area known as Old Bourbon. First settlers who brought whisky tradition to America were Scotch-Irish of Pennsylvania. To help finance the revolution against the British, the Continental Congress put a tax on whiskey production. Western Pennsylvania settlers refused to pay and so George Washington to restore the order in the ensuing whisky rebellion sent an army to quell the uprising. Washington mobilized 13000 militia to deal with the uprising but the army dispersed before any conflict, failing to restore order so Washington decided to offer a deal to the stubborn scotch and irish settlers giving them incentives for those who would move to Kentucky. This move changed the way whiskey was made, as rye wasn’t as abundant as corn. Bourbon was born. Why corn was used in Bourbon? The governor of Virginia (Kentucky was part of Virginia at that moment), Thomas Jefferson, offered pioneers sixty acres of land if they built a permanent structure and raise native corn. The fact that none can eat 60 acres worth of corn and that corn was too perishable and bulky to transport for sale helped the pioneers to decide converting it into whiskey solving both problems. This first corn-based whiskey was a clear distillate as it wasn’t aged in oak barrels yet. France, having at the time still their own territories in North America assisted rebels in war of Independence against the British. In acknowledge of this help french names were given to near settlements and counties. So between 1780 and 1786 west part of Virginia was divided and one of those parts was named Bourbon County after the french royal house. Kentucky become a state in 1792 and Bourbon one of its counties. Reverend Elijah Craig from Bourbon County, legend says, used old barrels to transport his whiskey to market in New Orleans. He charred the barrels before filling, probably to remove traces of previous contents. After that, whiskey did a long trip to market where it gets a mellowed flavour and has taken on a light caramel color from the wood. Being from Bourbon Country his whiskey was soon started being called bourbon. The fact is that the same settlers that brought distillation to America would know that ageing whisky in a wood cask would make the drink better so perhaps this cool legend is just that, a legend. It was in 1840 when it officially became known as Bourbon as previously was known as Bourbon County Whiskey or Old Bourbon County Whiskey. Since 1870 Bourbon is shipped in jugs instead of barrels. In 1917 the production and the possession of alcoholic beverages was forbidden in wartime. After the end of the WWI maintained the law, being called dry states. In 1919 the law reached the whole country. The prohibition forbade all consumption of alcohol, even beer. ( Oh my God! ). 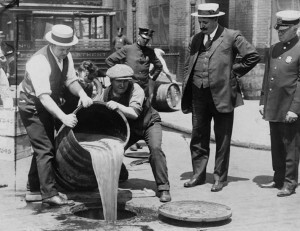 The Volstead act became a constitutional amendment in 1920. All supplies of alcohol were destroyed, the distilleries dismantled and used for other purposes and only a few were allowed to keep producing alcohol for medical purposes. The prohibition destroyed most of american distilleries and create a strong smuggling system across North America borders, mostly from Canada and the Caribbean states. Realizing the prohibition was not able to stop alcohol consumption and that it was creating a huge criminal industry it was decided to legalize again alcohol in 1933 in the 21st amendment. In 1964 a congressional resolution protected the term bourbon and since then has the product being defined. Made from a mash of 51% of corn. Although law stipulate that origin must be in the United States, 95% of Bourbon comes from Kentucky. There are several kinds of bourbon, each of them usually stated in the label. Different distillers vary the proportion of grains in the mash and the proof it is stored in the cask. Typical grain mixture, known as mash bill, is 70% corn and the remainder wheat, rye and malted barley. The use of a relative large percentage of wheat produces what is known as wheated bourbon. Originally distillation was done using alembic or pot stills but now modern distilleries uses continuous stills. Kentucky Bourbon Trail attract visitors to six distilleries in Kentucky: Four Roses, Heaven Hill, Jim Beam, Maker’s Mark, Wild Turkey and Woodford Reserve. Nowadays bourbon’s production is concentrated in Louisville, Frankfurt and Bardstown. Bourbon produced at Tennessee is typically refered to as Tennessee whiskey or sour mash whiskey. Straight whiskey is whisky without any additives, as caramel *ejem*, created by distilling a fermented cereal grain mash to create a spirit not exceeding 80% alcohol content by volume (abv) and then aging the spirit for at least two years. Filtering and dilution with water, while retaining at least a 40% abv concentration, are the only allowed modifications for straight whiskey prior to its bottling � the addition of caramel and other colorings and flavorings is not allowed. American straight whiskey must be aged in charred new oak barrels and must be put into the barrels for aging at a concentration not exceeding 62.5% abv.